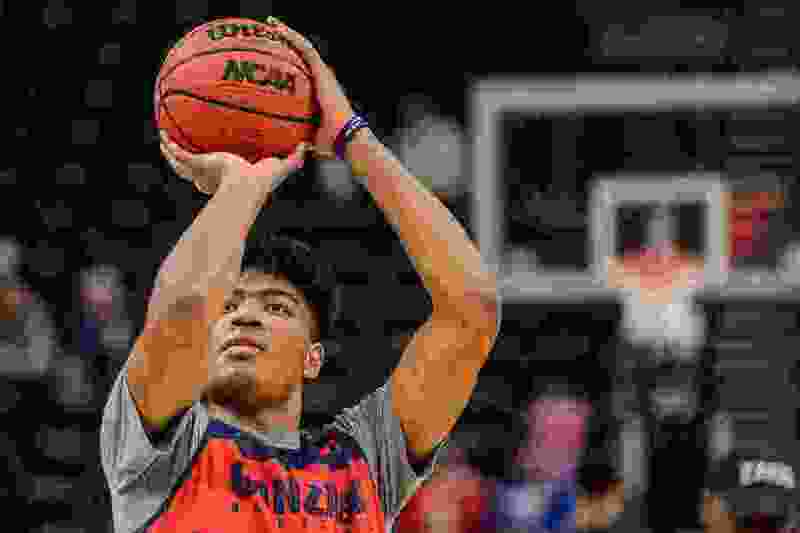 (Trent Nelson | The Salt Lake Tribune) Gonzaga Bulldogs forward Rui Hachimura (21) as the Gonzaga Bulldogs practice for the 2019 NCAA Tournament in Salt Lake City on Wednesday March 20, 2019. Tipoff • Thursday, 5:27 p.m.
About the Knights • They won their first NCAA Tournament game in their 70-year history on Tuesday night, upending fellow No. 16-seed Prairie View A&M 82-76 in a First Four game in Dayton, Ohio. … Senior G Darnell Edge scored a career-high 33 points and was 7 of 9 from 3-point range in the win and sophomore G Jahlil Jenkins scored 20 of his 22 points in the second half. He also had six assists. … They have won eight straight games, 14 of their last 16, and went 12-6 in the NEC. … All five of their starters are averaging in double figures. … They are 18-0 when leading with five minute to play in regulation. About the Bulldogs • They are making their 21st straight NCAA Tournament appearance, the fourth-longest in the field, and 22nd overall. They are 31-21 all-time in tournament games and 6-3 in games in Salt Lake City. … They lead the nation in field goal percentage (53.2), scoring margin (23.8) and scoring offense (88.8). … Senior G Josh Perkins has started in 12 tournament games and averaged 8.3 points in those games while dishing out 38 assists. Sophomore G Zach Norvell Jr. averages 19 points per game in the tournament, in three games. Junior F Killian Tillie has appeared in eight tournament games.